No matter how seemingly forsaken and uncomfortable the place where we are located in difficult times, God will always find us. and He has found me in this place. But He found me, in a wasteland, in a deserted place. Surrounded by lack, pressed on all sides in a narrow space. As I shivered in the darkness wrapped in shame and disgrace. With painful memories of failure nothing could erase. But with loving arms God reached out to forgive and embrace. The lonely desert with its interspace. and looks back [to the things behind] is fit for the kingdom of God. Accompanying the poem is a lively version of the spiritual “Keep Your Hand on the Plow” sung by Mahalia Jackson, the Queen of Gospel, who reigned throughout most of the 20th century. Before God even spoke, the work was already done. He knew I would seek to be all He called me to be. “Upon Turning Seventy-one” today in 2013. “Young man, you’re born for luck,” I heard a wise woman say. Happy, blessed, and fortunate is the man in the first Psalm. As I flourish in the courts of God as a fruitful palm. L-O-V-E provides the basis for four qualities of a good father. On June 15, the day before Father’s Day, my daughter, Melissa, and I shared at a Father/Daughter Luncheon/Tea, which was part of a 2-day conference in Columbus, Ohio sponsored by Girls Night Out Slumber Party (GNOS). Phillippa Singleton Jackson, Founding President and Director of this community resource for young girls, had invited me to speak at their luncheon, and Melissa “just happened” to be in town for Father’s Day and my birthday as well as for a wedding reception in her honor. Even though she is getting married soon, I realize that she will always be “Daddy’s Little Girl.” She reflected on what’s it’s like to be “Daddy’s Little Girl,” and I shared four qualities that make up a “good father,” the kind of father I strive to be. It has been said that you can give without loving, but you cannot love with giving. A father loves and shows his love by giving . . . his time, his attention, his resources, all that he has he is willing to give to support his family. A “watchman” in Bible times stood on guard to protect the community from those who might come into take from the resources of the people. Similarly, the father observes who’s coming in and who’s going out of his environment. A good father is especially keen in checking out any young man who is trying to come in take away the precious treasure that is his daughter. Fathers have an application process in place, a series of interviews and preliminary requisites leading up to the first date and beyond. A good father is always on the lookout and always looking out for, praying interceding for his daughter. Fathers wear a jeweler’s glass –In the same way that an expert gemologist keeps a jeweler’s glass around his neck when examining precious gems, I keep my eyes open, ever watchful for those rare “blue diamonds” whose color adds to their value and rarity. Diamonds are precious gems that are of great value, but blue diamonds are even more valuable because they are even more rare than white diamonds. A good father is always looking for those hidden qualities or traits that others might not see. Indeed, he finds them and bring them to his daughter’s attention, and reminder her of just how special she is. She is unique, one of a kind, a priceless treasure that he values and thanks God for, and he tells her so. Like God, the ultimate example of a good father, each individual who strives to be a good father will love because God is love, and He tells us to love one another with a pure heart fervently. Like a watchman on the wall, a good father observes and watches out for his daughter. Like a jeweler, a good father is always on the lookout for special qualities that make a precious gem even more valuable, as he values and esteems highly his daughter. Like a coach, a good father encourages and supports and celebrates each victory and comforts and cheers up any shortcoming along the road to success. I conclude this blog entry with a poem “A Blush of Innocence.”The original inspiration for the piece was an experience that occurred more than 30 years ago when I taught Children’s Fellowship, and I had gone away for a period of time and returned a few years later. One of the young girls whom I taught had blossomed into a beautiful young lady, and I was amazed at how quickly she had grown up. She was not even aware of my presence, and she probably didn’t even remember me, but I marveled at her poise and maturity. After a few moments of talking back and forth with her friends, someone said something humorous, and she began to blush. In that instance, I recognized that glimpse of innocence in her eyes, a precious glint that you wish you could freeze frame and keep forever in your heart and mind. Later I came to recognize a similar look in my daughters’ eyes, and when I completed the poem inspired by the experience with the young girl, I dedicated it” to them. The essence of youth to its purest stage. The heart with weeds and walls that hide the glow. Pure innocence blooms in a young girl’s eyes. For fruit shall come and the blossom perish. No smile outshines a blush of innocence. 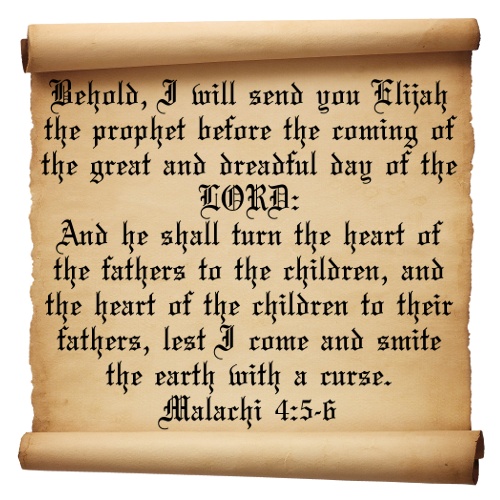 This passage from Malachi 4:5-6 in the New King James Version comes to mind on Father’s Day 2014. The third Sunday in June is Father’s Day, a day of commemoration and celebration to honor fathers–whether as Stepfathers, Uncles, Grandfathers, or “Big Brothers” or adult male family friends—we recognize all men who have acted as father figures in our lives. The accompanying video provides a rendering of the hymn in celebration of the Fourth of July. I found the accompanying video “Encourage one another” which is a compilation of the same verse from I Thessalonians 5:11 and other scriptures and words of encouragement from Kimberly Culpen. May we all be strengthened and encouraged today. Recent teachings on the 4th Commandment have inspired a couple of poetic expressions. As I attempt to hone my skills as a writer, through this blog or by way of my Examiner.com pages, I sometimes think of the words of Saint Augustine: “To contemplate the truth and to share the fruits of that contemplation.” Recently I have been giving considerable thought to a series of messages given by Pastor Michael Bivens relative to the 4th Commandment: “Remember the Sabbath day and keep it holy. In reflecting on the first message of the series along with a follow up message by his wife, Pastor Joy Bivens, I was inspired to write two poems which are included in today’s blog entry. For the past 46 years, I have been an ardent student of the Word of God with a passion to study the Bible and teach its precepts. As I took extensive notes during most Sunday morning messages, I would sometimes review my notes later that evening and reflect and write. For a period of time, I would review my notes on the following Monday morning when my schedule allowed me to do so. Since the reminder of the significance of the Sabbath, I now devote Sunday evenings to reflecting, writing, and communing with God in a new way. Time of rest and worship, devoted to God solely. Never forget–Imprint this truth in your heart and mind. God’s will that we cease from labor and serve Him wholly. Represent creation, even as He is holy. Serve not yourselves but the true and living God only. Leave a legacy of service for all who come behind. Do remember the Sabbath day. And reflect the glorious creation He designed. Seek God’s perfect will and do it and then be aligned. Keep God first and never entertain the unholy. This familiar passage also relates to keeping the Sabbath, as God intended it to be kept. “If you will . . . , then I will,” says the Lord, who cannot lie. 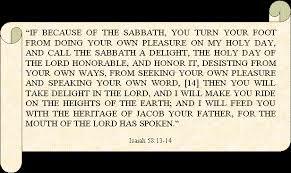 Who do your good pleasure to make the Sabbath their delight. To honor you and obey you this day is my good pleasure. To serve you shall be my delight beyond all measure. I will speak for you–what would you have me to say? I do not seek my own way but honor you this day. And feed me with the heritage of Jacob, my father. To lavish love upon those who serve you is no bother. And bring to pass all things the mouth of the Lord has spoken. Little biddy things can happen that don’t make sense. Changing one little letter makes a big difference. From “gotta” to “gitta” shows a whole new attitude. Work heartily for the Lord whatever you do. Remember in the end that He will reward you. Especially when you face tasks you don’t “wanna” do. Put off the old, put on the new–renew your mind. “ ‘Gotta’ to ‘gitta’ ” is thinking of another kind. Move ahead in faith, and you won’t be left behind. We have to change in the midst of these changing times. Standing on the mountain top is the one who climbs. From “gotta” to “gitta” makes a really big difference. 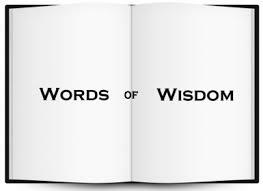 Over the past couple of weeks I have been reading about and reflecting upon wisdom as revealed in the Book of Proverbs. Often I begin my day with such a period of meditation and reflection, which often results in a poetic expression that I incorporate into a blog entry for that day. 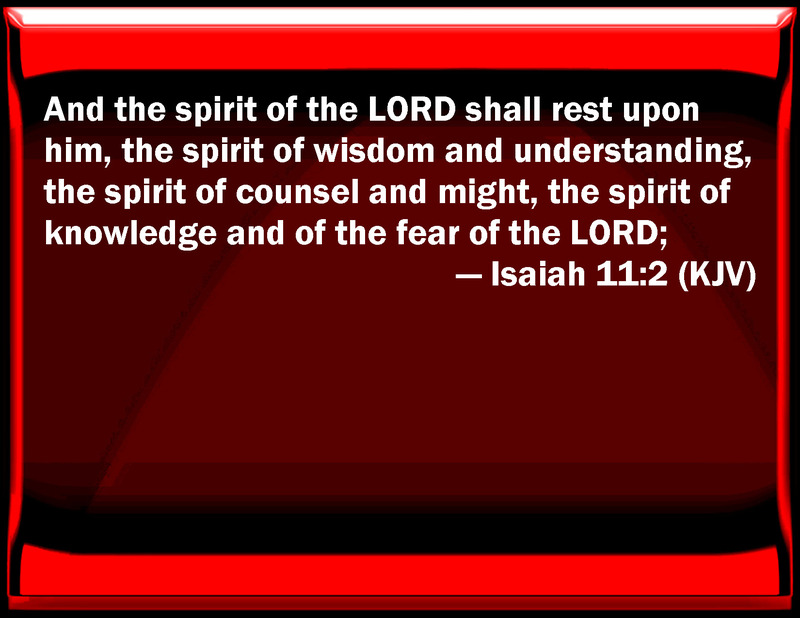 In a number of the poems posted over the past two weeks there have been references, not just to “wisdom” per se, but to the “spirit of wisdom” which is a specific aspect of the “seven spirits of God,” spoken of in Isaiah 11:2 and elsewhere in the Bible. 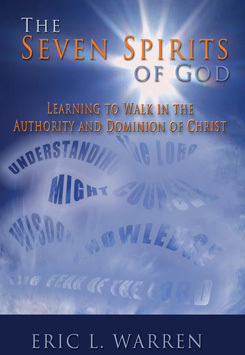 Apostle Eric L. Warren’s most enlightening book The Seven Spirits of God: Learning to Walk in the Dominion and Authority of Christ provides an in-depth discussion of this vitally important and relevant concept. One of the seven spirits mentioned in Isaiah 11:2 is the Spirit of Wisdom which has been mentioned in this series on wisdom.